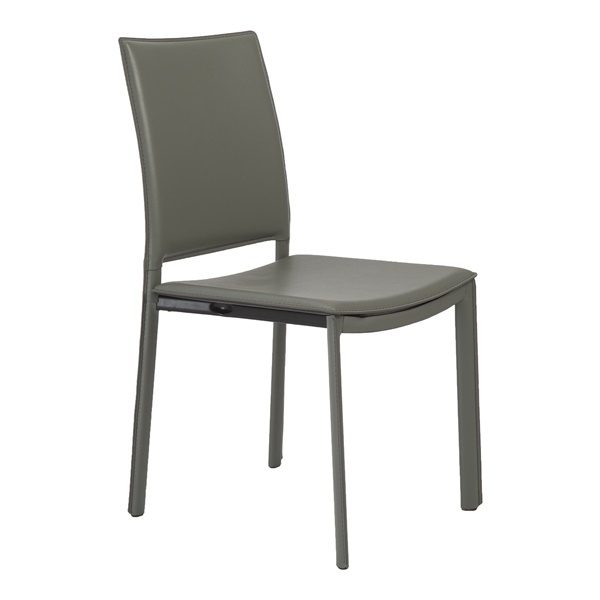 A beautiful, clean silhouette and superb function make the Kate Side Chair a perfect addition to any dining space. This chair’s mixture of classic lines and a contemporary feel fit seamlessly in with many different dining table styles. The Kate features a steel frame, making it durable and sturdy enough for years of dinner parties and family get-togethers. The entire chair is wrapped in faux leather for a smooth, sleek look and a supple and luxurious feel. The upholstery comes in a range of color options – choose one that’s right for your space. While it makes a great dining chair, the Kate Side Chair can be used as occasional seating for a living room, office, or media room. The picture of the dark gray chair online looks more light than dark .how do I get a swatch sample? We will be happy to request a swatch to be sent to you from the manufacturer, free of charge. To request a swatch you may email us at [email protected], with the name of the item, colors you would like to see and your mailing address, and we will then get the swatches sent right away. Is the white a true white?